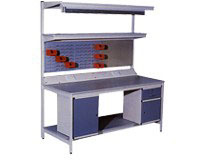 A full range of standard duty workstations, with fully welded base frame and 20mm thick worktop with a choice of surfaces. Base units are manufactured to accept an extensive range of accessories, most of which can be added as and when necessary. Powder coat finish, range of colours available. Accessories may be added as required. Choice of edging PVC: grey, balck or brown Beech hardwood. 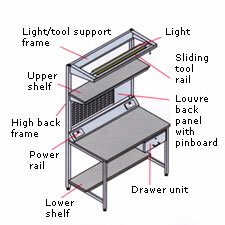 2400mm long workbench available to order.